Kleresca Rosacea Treatment is available to The London Skin and Hair Clinic as an effective treatment for patients suffering from rosacea. What is Kleresca Rosacea Treatment? Kleresca Rosacea Treatment is a non-invasive treatment that uses fluorescent light energy to reduce the signs and symptoms of rosacea. The treatment is based on the principle of biophotonics: the use of fluorescent light energy to stimulate the skin’s own repair mechanism. What is involved in Kleresca Rosacea Treatment? Kleresca Rosacea Treatment uses fluorescent light energy that penetrates the different layers of the skin and activates its own healing mechanisms. The treatment uses a specially formulated, chromophore containing gel that is applied on the area affected by rosacea, typically the face. These chromophores are activated under the Kleresca blue light Lamp. The chromophores then convert the blue light into fluorescent light energy. It is the fluorescent light that contains the properties to penetrate the different layers of the skin and stimulate it at a cellular level. Kleresca Rosacea Treatment is performed once per week for four weeks. The treatment is comfortable and pleasant with high-efficacy and little to no downtime. The treatment involves application of the photoconverter gel and then illumination under a multi-LED Kleresca lamp for nine minutes. The gel is then removed and the skin is cleaned and moisturised. Who is suitable for treatment with Kleresca Rosacea Treatment? 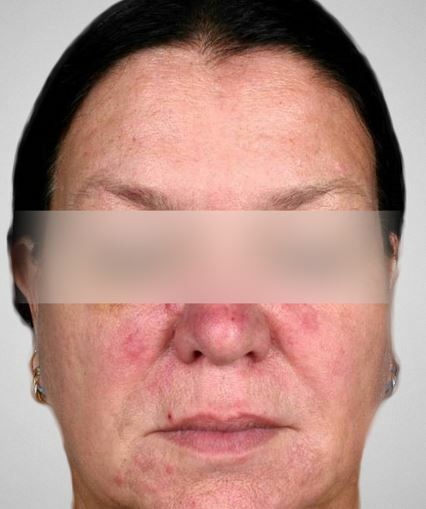 Kleresca Rosacea Treatment has been designed to treat patients with rosacea that may suffer from very sensitive skin. What are the results of Kleresca Rosacea Treatment? 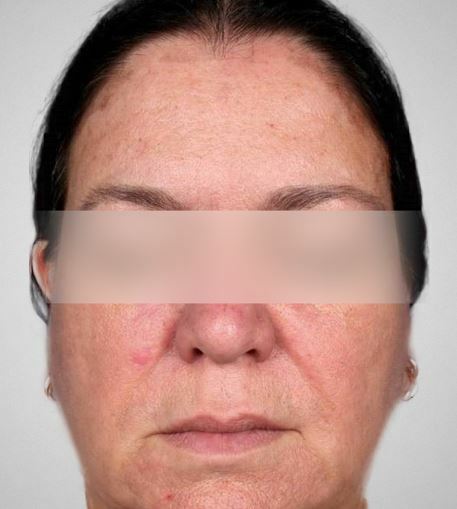 Patients find that Kleresca Rosacea treatment offers a gentle treatment with little or no downtime, high safety and efficacy, targeting of rosacea signs and symptoms, and overall improvement of skin quality. Kleresca Rosacea treatment targets the signs and symptoms of rosacea by improving vascularization in the treated area as well as reducing inflammation and redness. Patients should feel relief not only with the visible symptoms of rosacea but also in the sensations related with this skin disorder. Kleresca rosacea treatment is seen to reduce the overall stress level of the skin, thereby reducing the feeling of burning and stinging. The biophotonic treatment induces a healing response, improving the overall skin quality. 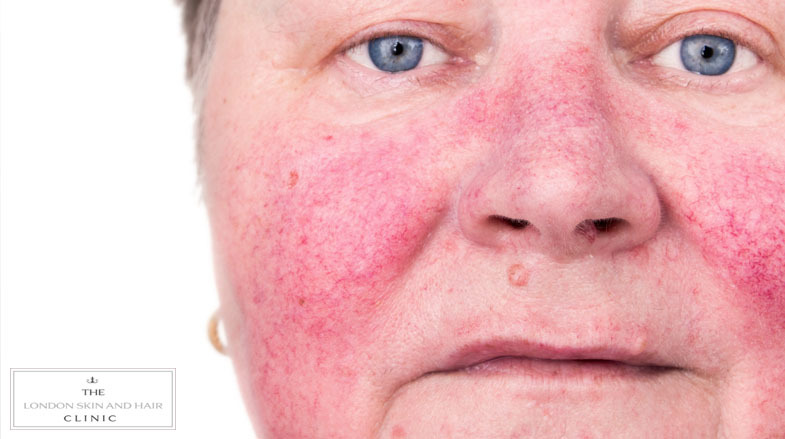 What are the risks or potential side-effects of Kleresca Rosacea Treatment? In clinical trials, Kleresca Rosacea Treatment showed high safety with no serious adverse events, and the treatment itself was considered to be a pleasant and comfortable experience. Side effects seen in some patients, are all transient and may include redness, swelling and hyperpigmentation (bronzing of an area of the skin). Is there any preparation needed before having Kleresca Rosacea Treatment? There is no specific preparation required for Kleresca Rosacea Treatment and in most cases patients can commence treatment soon after their consultation with one of our Dermatologists. What aftercare is needed for Kleresca Rosacea Treatment? Our Dermatologist will advise on the treatment plan for maintenance and dealing with rosacea flare-ups post treatment. In some cases this may involve booster treatments, a personalised skincare regime, and treatments including medical facials or laser treatment. What is the cost involved in having Kleresca Rosacea Treatment? Patients will need a consultation with one of our Dermatologists prior to Kleresca Rosacea Treatment. Consultation prices are available on our fee schedule here. Kleresca Rosacea Treatment has a charge of £850 which covers 4 treatments over a four week period. Subsequent or booster sessions may be required at a cost of £250 per session. Kleresca Rosacea Treatment is not currently funded by private health insurers, and so we are unable to accept insurance authorisation for this treatment.